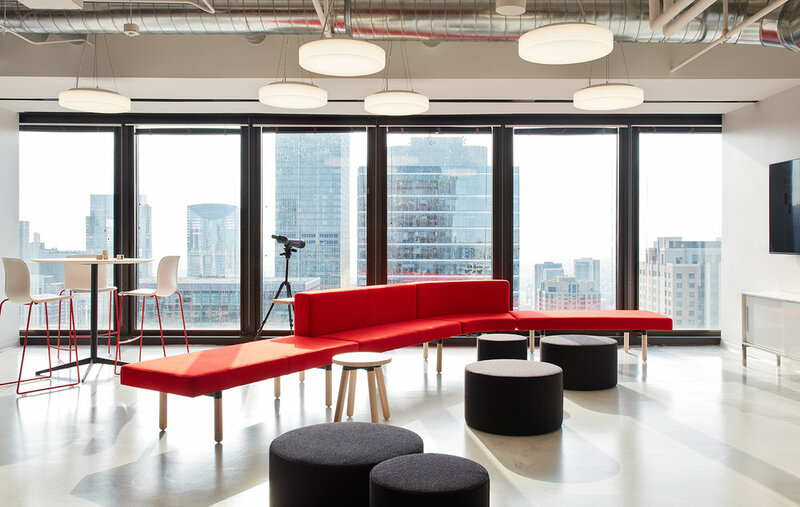 This space was designed for a well-known international consulting firm focused on helping organizations better leverage technology, and so it was vital that it encouraged collaboration, improved functionality and generated a strong sense of creative energy. To achieve this, we used a dichotomy of playful color against a rigid structure to create an intriguing laboratory vibe. Highly visible technology is cleverly juxtaposed with exposed storage, flexible furniture and other practicalities. 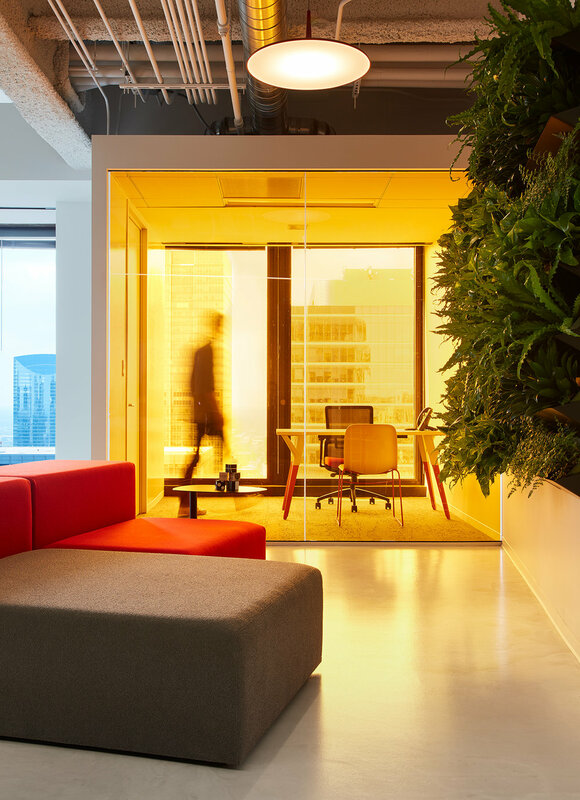 The most successful projects usually involve significant collaboration, and the client’s insistence that the workplace declare itself as a creative space from the elevator lobby helped give us a clear direction. We achieved this big impact through the creation of a bold portal door, with jarring angles and bright color. The reception desk area, which doubles as a bar, is visible from the corridor, beckoning visitors to come in. A double-sided screen with staff-created artwork on rotation gives the room a dynamic visual from all angles. In the main work station area, a dry-erase topcoat covers the walls, stressing the importance of visualizing ideas to the firm. Small private offices, open for all to use, give staff a quiet retreat, while two large conference areas at either end of the space allow for larger meetings and presentations. 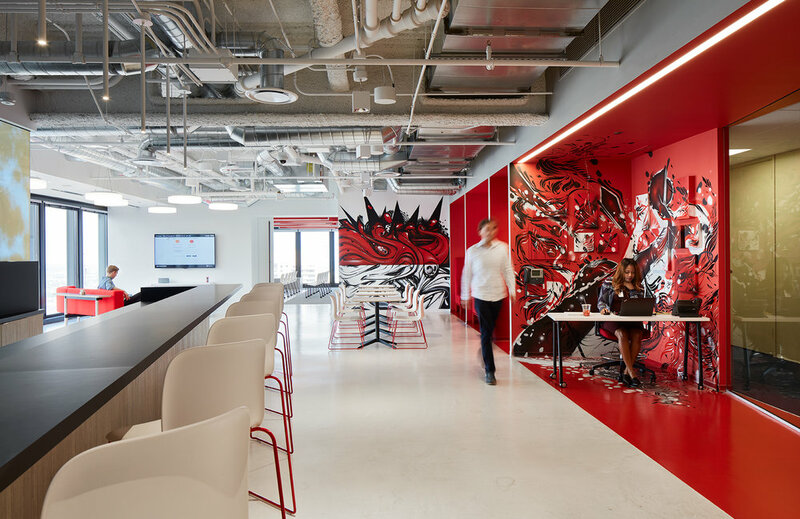 Murals by street artist Won Kim and cheeky elements, like a single black chair in a sea of white ones, give the high-tech workplace an inspiring spirit.